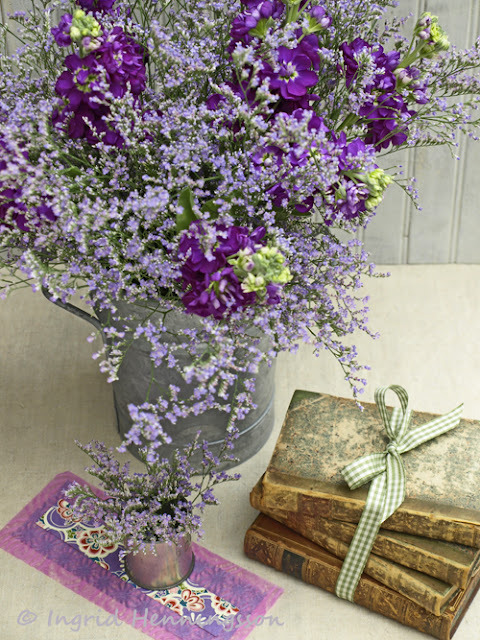 A frothy purple and lavender flower arrangement for the summer. 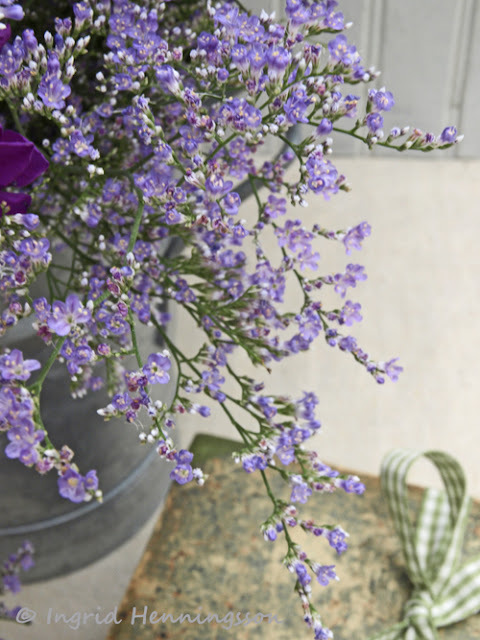 This time it is a different Statice or Limonium as it is also called. 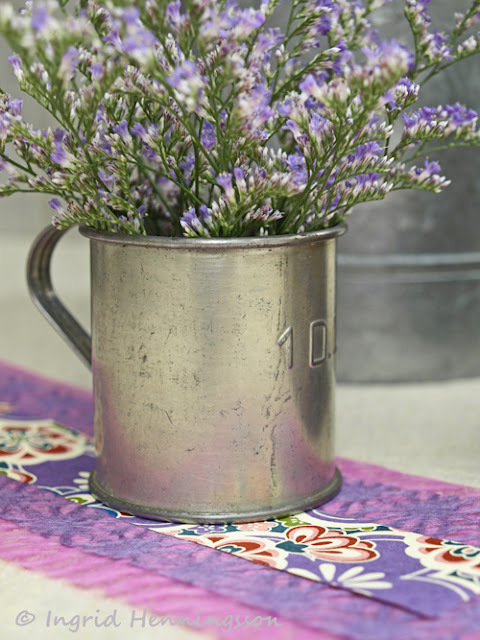 The common name is Sea lavender but there are many different Statice and Limoniums so it can be a bit confusing. This one has a much smaller and more delicate flower. 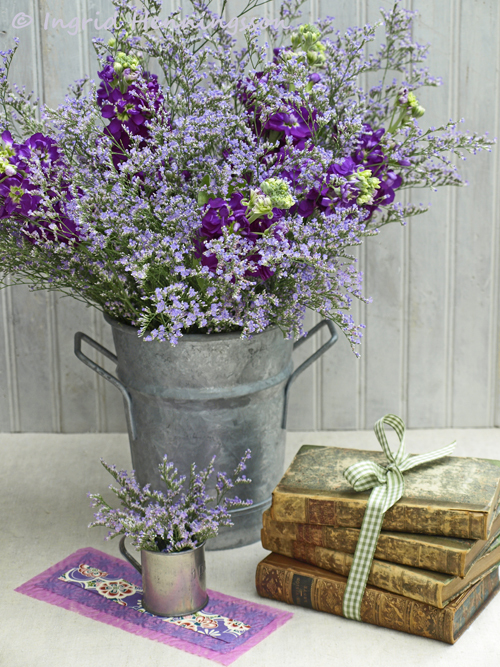 I have mixed in deep purple stock flowers that gives the arrangement a bit of a punch. 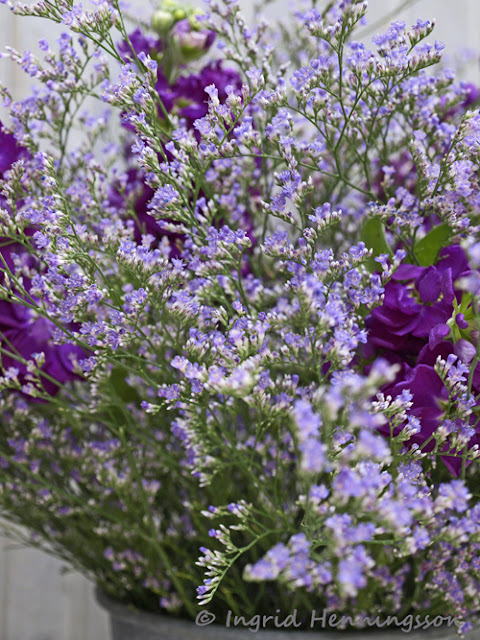 The easiest way to make the arrangement is to first arrange the Statice in your hand - to get a fairly even overall arrangement. Cut the stems all the same length and put them in the container. Strip most leaves off the stems of the Stock and slide them in where ever you like. The Statice has flowers in every direction so you can cut the stems of the Stock a bit longer to have them stick out of the frothy Statice, making them a more dominate feature. You can also do what I have done and that is to cut the Statice stems a bit shorter and just have them poking through the more gentle colour of the Statice. A few small stems went in a much smaller container. It sits on top of three little pieces of Japanese papers in pink and purple, two are tissue paper and the top one is an origami paper. They are all from the Japanese Paper Place. The smaller container is an old vintage coffee measure. It has a small handle and it says 1 DL on the front. It is very cute holding a small arrangement of flowers. Some beautiful and very old books. The book on the bottom is a leather bound edition of Divine Comedy written by the Italian poet Dante in the 1300's. 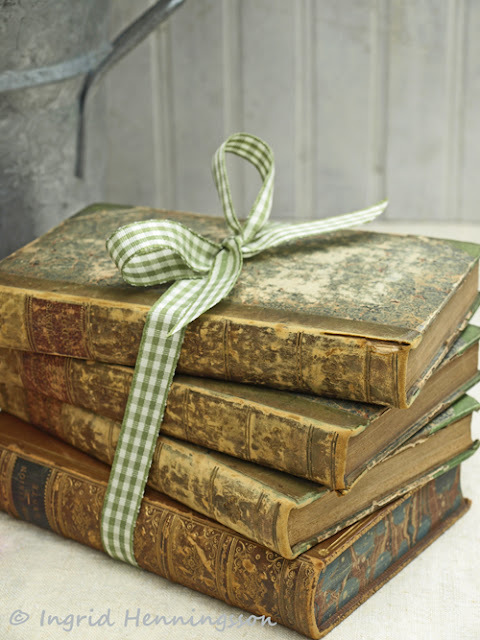 The others are beautifully faded books of poems. Will I ever read them? I don't know - right now they are just beautiful objects or props. It is summer and time for some holiday. I am taking a break from blogging. I hope you are all having a wonderful summer and I will see you back here soon. This is a beautiful arrangement. 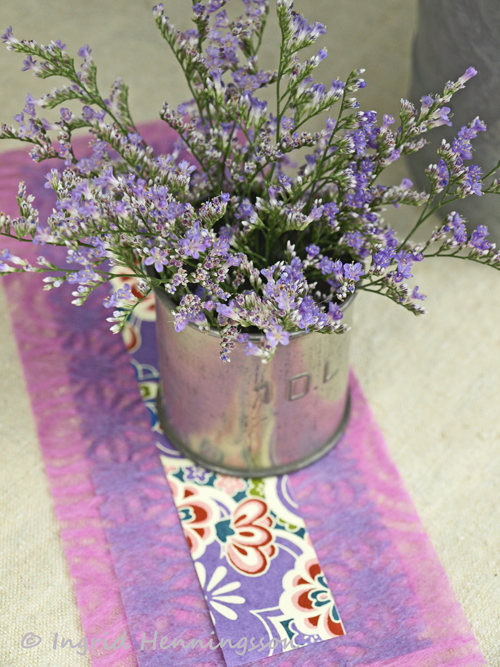 The sea lavender and deep purple stock make a lovely combination! Oh! What a wonderful way to end this day! To enjoy your pictures and arrangements! Todays choice attracted me especially! 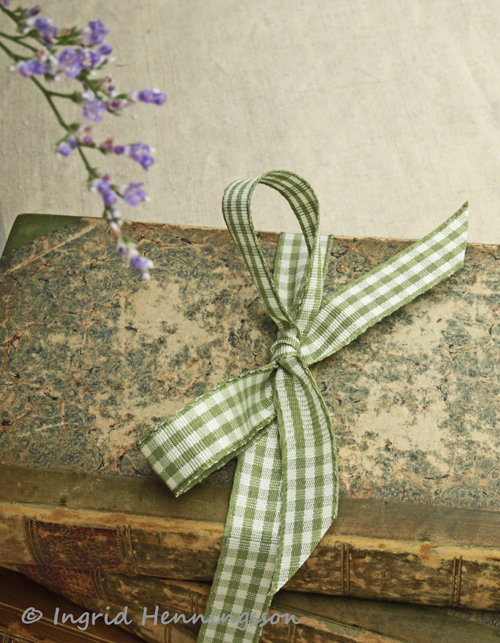 Two of my favorite things: flowers and old books! ;-) Thanks for the inspiration, Ingrid! I love the different shades of purple in this flower bouquet. It brings the summer into the house which is a good thing since we certainly can't find it outside at the time. 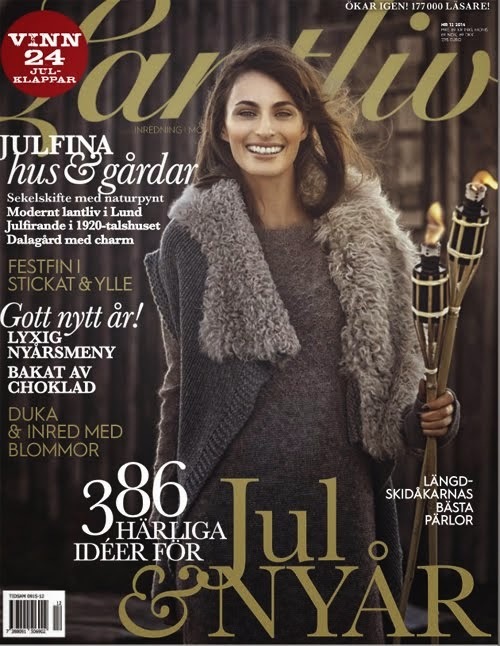 Ingrid, please do enjoy your summer holiday. 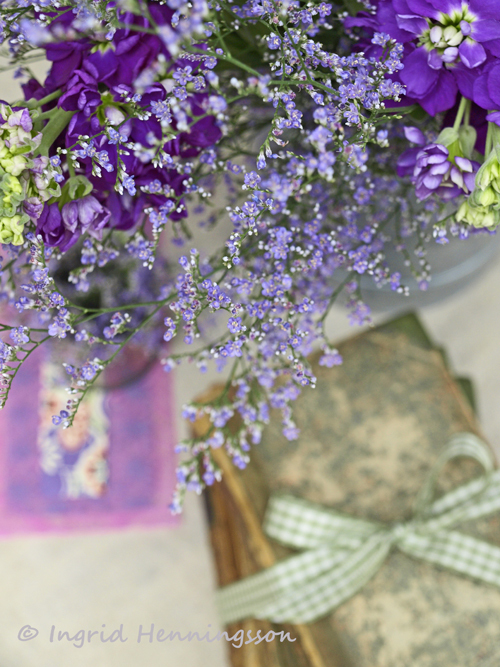 Meanwhile, let me tell you how lovely the lavender statice, stock green ribbon and stems and silvery pewter components of your photos suit each other. Do you use "frogs" to keep your flowers in place, and if so, which do you prefer. My mom had heavy glass frogs, like paperweights with holes punched in their tops. She also used metal frogs that had spiky tops. I guess that both styles have their purposes? Beautiful as always. Enjoy your vacation! I like he first photo very much. Beautiful arrangement.